Experts Uncover A Painting Van Gogh Covered Up A work by Vincent Van Gogh was recently uncovered at a museum in the Netherlands. But it wasn't lost in some dusty corridor, it was hidden under the paint of another Van Gogh. Scientists found it by using a giant X-ray machine. 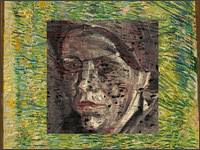 Scientists found this portrait of a woman hidden behind Vincent Van Gogh's "Patch of Grass." It's rare that new paintings by Old Masters are discovered. But that's exactly what happened in the case of a recently uncovered work by Vincent Van Gogh. It was found at a museum in the Netherlands — but the painting wasn't lost in some dusty corridor, it was hidden under the paint of another Van Gogh. Scientists using a giant X-ray machine found an early portrait of a peasant woman beneath Van Gogh's 1887 work "Patch of Grass." "What you see in the discovered portrait is a fairly detailed picture of a Dutch rural lady ... very similar to those Van Gogh painted in the same period," says Koen Janssens, a chemistry professor at the University of Antwerp in Belgium. Janssens and Joris Dik of the Delft University of Technology in the Netherlands led an international team of researchers that uncovered the hidden painting at the Kroller-Muller Museum in the city of Otterlo. Art historians had suspected for years that there was something hidden beneath "Patch of Grass." But Janssens tells host Andrea Seabrook that the team steered away from the usual method of directing X-rays through a painting. Instead, they tried a new technique in which a narrowly-focused X-ray beam reveals the chemical makeup of the layers of paint. Different pigments are made of different elements, so the team was able to reconstruct the earlier portrait using a computer and even get an idea of the colors used in the buried work. Researchers detected such substances as mercury sulfide, used to make vermillion, and chromium oxide, which produces a greenish color. Janssens says Van Gogh painted over about a third of his older works. And the team is already deciding which painting to X-ray next. Video: See how scientists in the Netherlands uncovered the hidden painting.